That evening we decided to go with Justine and Steve to see a performance of gamelan and dance at Peliatan, a neighboring village only about a mile and a half from the center of the village of Ubud. The deal here is that you don't really buy tickets for the performance - you buy them for the transport. If you walked there it was free! We got there early and found seats right up at the front. Before us were arrayed the familiar instruments of a Gamelan Gong Kebyar - on the right, the lead metallophone, the ugal, and the other gangsa instruments, pemades and kantilan. On the left, the long reyong played by four players, and in the back, the bass jegogan instruments. 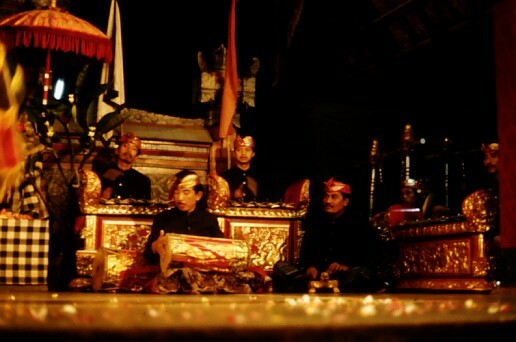 In front of the jegogan, on either side of the dancers' entrance were the hand-drums or kendang, and also a ceng-ceng - a small instrument consisting of sets of finger cymbals used for percussive punctuation. The players took their places at the instruments and at a cue from the lead drummer, launched into their opening piece - as is tradition, an instrumental gamelan piece, played with amazing precision. The Peliatan gamelan is well-known as a first-rate gamelan, and here we were in Peliatan, Bali, experiencing them in their natural setting. To a gamelan player from America, it was quite an experience. This picture shows the lead drummer who directs the gamelan using complex drum cues. Behind him are the jegogan, and to his left, the ceng-ceng. This photo shows the gangsa - the pemades in the front row, and the kantilan behind them. In the back you can just make out the striped silver gong poles for the gongs that denote major cycles in the piece. 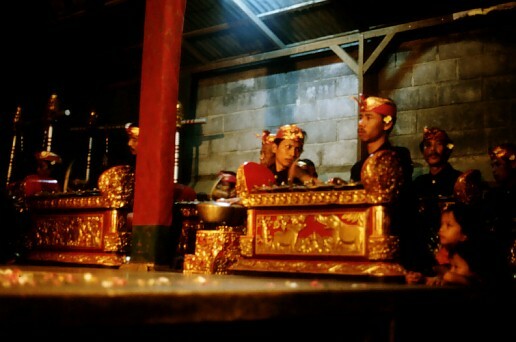 Between the pemades is the kajar or time-keeper who beats time and provides an aural grid over which the complex interlocking patterns of the gamelan are laid. This photo is of the Baris dance - a very well-known dance of the warrior, traditionally performed by a young boy. This boy must have been about nine, and he was great! Fabulous poses, darting eyes - just wonderful. This is a modern dance, depicting youthful impetuosity and coquettishness (according to the program). This dancer was amazing. 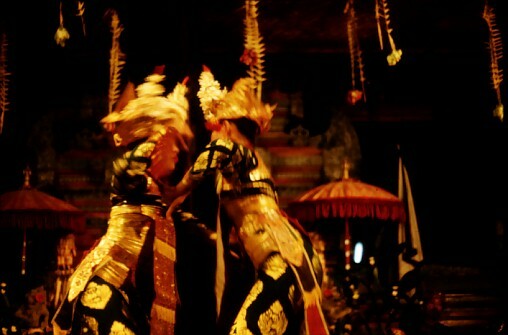 This is a legong dance performed by two dancers. Aren't the costumes beautiful? Our daughter Julia had studied legong dance back in California, under our friend Made Sukerti when she was younger, and had actually learned the welcome dance herself. 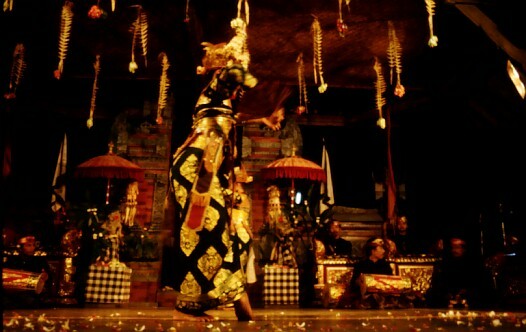 She was thrilled to see the dance she knew actually performed in Bali. 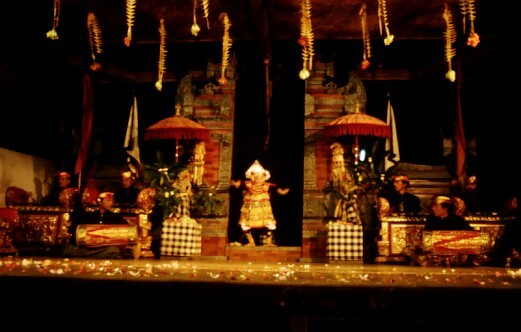 Here at Peliatan there were also aspiring dancers - several little Balinese girls, about 6 years old, had crept up to the front of the stage and were mimicking the dancers' movements. Someday, they too would be on the stage dancing the legong. 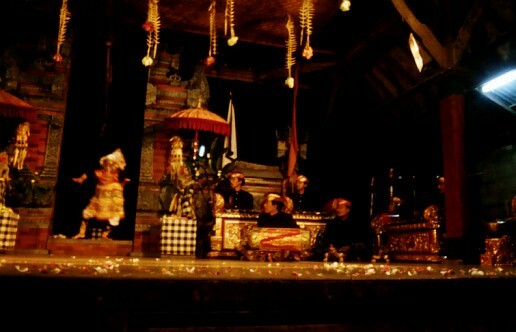 The final part of the program was a version of the traditional story of the battle between the dark and light forces as personified by the witch Rangda and the protective Barong. Each village seems to have its own version of the story - the story related below is according to the program notes, written in rather sketchy English. 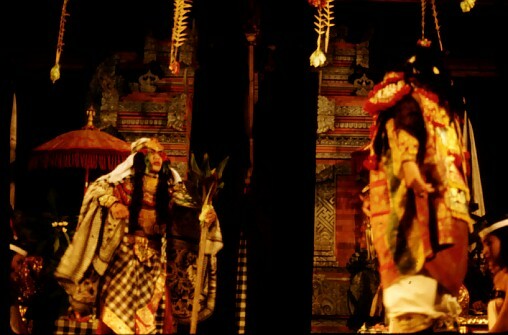 Here, the witch and practitioner of black magic, Dayu Datu, shown at left, is approached by I Wayan Buyar, who wants her help in wreaking havoc in the kingdom of Dukuh Siladri, after King Siladri has rejected Buyar's offer to marry Siladri's daughter. (Other versions of the story have the witch's daughter who is the one who is spurned). Buyar agrees to make it worth her while to use her powers of black magic to destroy the peacefulnes of the kingdom of Siladri. She sends one of her disciples to Gunung Kawi, where she transforms into the demon Celuluk, and starts to get up to no good. But never fear, the gentle but powerful benevolent and protective figure of the Barong comes to the rescue. The Barong is often depicted as a kind of lion, with long shaggy hair, but here he is a tiger. There are two men inside the Barong figure, and they ham it up in comical routines where the Barong plays with his feet and tail. 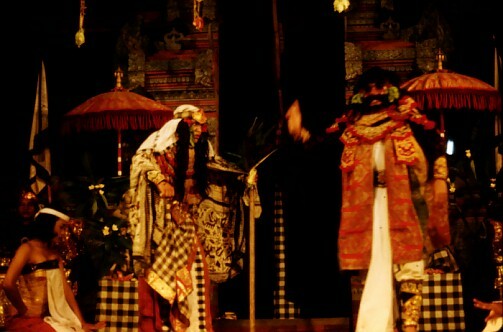 Here, King Siladri is telling the Barong about what has been going on in his kingdom. 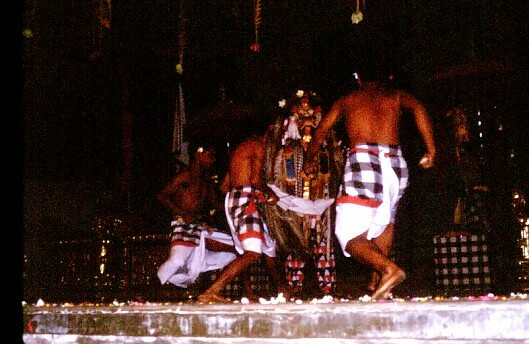 A battle between the Barong and Celuluk ensues. Celuluk is unable to overcome the power of the Barong, so Dayu Datu transforms her into Rangda, Queen of Black Magic, to unleash even more powerful forces. 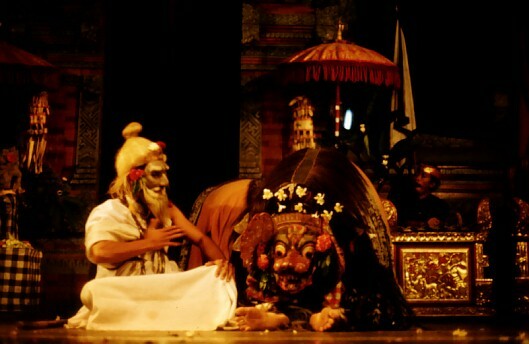 The Barong and Rangda do battle. At the end of the story, the performance suddenly takes on a disturbing tone of real violence, as men rush onto the stage and attempt to stab Rangda with knives. Rangda (by now transformed from a widow into a monstrous figure with long white hair, huge fangs, and natty red, white and black pants) is protected from the knives by her supernatural powers, and through her powers of mind control, she forces the men to turn their own knives on themselves. However, the men themselves are in trance and their knives don't penetrate their skin. Eventually the Barong comes back to the scene and releases the men from Rangda's power with clacks of his jaw, and with holy water from the priest, balance is restored and the story comes to an end. Rangda is never defeated - the Balinese believe that the forces of darkness and light must be kept in balance, and that the dark forces can never be entirely banished. Rather, they must be acknowledged and kept in balance with the forces of light. In this last part of the evening, the distinctions between performance and reality blur. Whether the performers here were really in trance is hard to say, but trance in Bali is quite a common phenomenon, and in less touristy performances, the violence of the attacks, the trances, and the magical protection from the knives, which are real and very sharp, is quite real. We chatted with some of the musicians after the performance while we were waiting for the bus back to town. They were very interested that we played in a gamelan back in the States, and invited us to the rehearsals of the Peliatan womens' gamelan, which we were never able to find!